Last year I bought an air purifier from Xiaomi, it was a hit. Perfectly deals with smog and impure air. It was very popular and Its now visiting more homes on daily basis. I decided to bring “his brother” from China, namely the humidifier – Xiaomi Smartmi Ultrasonic sterilizing Humidifier. 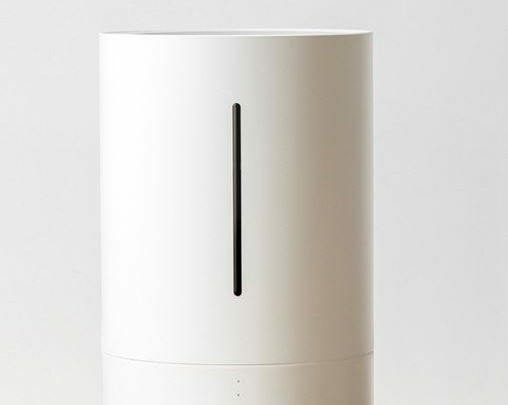 How does the Xiaomi humidifier handle it? Let’s move to the star of today’s entry. The Xiaomi Smart Ultrasonic Humidifier consists of four parts. Covers, 3,5L water jug, power supply and parts with a lamp responsible for destroying bacteria. UVGI lamp used ultraviolet disinfection, allows sterilization of 98,8% bacteria. The power supply has been placed on the cable for safety reasons, and not built into the device as it is in the case of an air cleaner. Water + 230V is not the experience that we would like to experience, the power supply changes the voltage from 230V to 34V. In the case of a purifier from Xiaomi, I advised you to cut the plug and set up a normal, European one. You educated me about the plugin, as a poppy-seed cake, I did not know such a plug. The power cord is ended with the so-called clover – the same solution have laptop chargers. All you need to do is buy a cable and you do not need to do anything. Dimensions of the humidifier 33.6cm x 20.7cm and 3,5litra water. All buttons that the humidifier contains are located in the last part of the device. On the front there is a button for manually changing the humidifying power. On the back, a button to reset the wireless connection to the router. There are four LEDs on the front of the device. The top three informs how powerful the humidifier works, and the last one is connected to the router. Wifi works on the 2,4Ghz frequency. The device like this Xiaomi product is made very carefully, each matching of the elements is perfect. Xiaomi has already proved that the air purifier does not have to disfigure the decor, the humidifier also confirms this thesis. The Xiaomi Smart Ultrasonic Humidifier naturally blends with the Xiaomi MiHome ecosystem application. In the main menu we can see what humidity has the environment and temperature. Below are three options. We can turn on / off, set the power of how the humidifier works (1,2,3) and the timer allows you to determine the time it should operate. If we move the finger from the bottom to the top, we will see an additional option. The most important thing is to define what humidity the humidifier should maintain. Five compartments are available, we can not regulate more. The optimum humidity is between 40-60% lower or higher values are unfavorable. When I turned on the device at home, it indicated humidity at 41%, I defined the desired value 50% and set the power to the maximum – 3. He worked a minute, maybe two, he reached 50% very quickly – I did not even have time to enjoy the view of cold water vapor The device is very quiet, with the 1-2 level practically impossible to hear. Only when we turn on the maximum power, you can hear that something is working in the environment, it is still below 42dB. The Mi Home application let you create scenes thanks to which one device causes the second reaction in the case of a humidifier there is only one option available, in my opinion completely unnecessary. If the humidity exceeds 70% then there will be X. I can not see the scenes for the humidifier if we exceed the humidity then what? turns on the camera? will the light shine? will send a notification to the phone? This is an independent device, I can not come up with any practical use of the scene. Xiaomi once again puts our health on, thanks to the use of ultraviolet disinfection, the humidifier very effectively fights bacteria. Usually humidifiers do not have UVGI technology, only a container filled with water, which under the influence of heat evaporates, such equipment does not kill the battery, actually creates better conditions for them. The humidifier in my house found a place in the bedroom, a better night’s sleep. Thanks once again Xiaomi for a good product. Online Referrals for Digital Marketing and SEO Services!